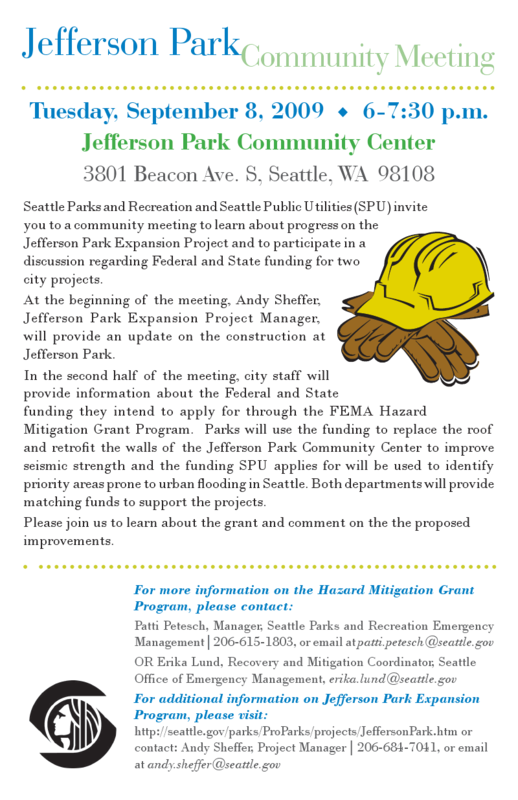 Tonight, in just over half an hour, Seattle Parks and Recreation and Seattle Public Utilities are hosting a meeting to learn about state and federal funding (through the FEMA Hazard Mitigation Grant Program) that the city intends to apply for, plus updates on the construction at Jefferson Park. 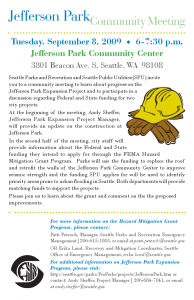 The meeting starts at 6:30pm at the Jefferson Park Community Center, 3801 Beacon Avenue South. We’re not able to make this meeting, but we’d love to publish your accounts and impressions. Send us your write-up, or feel free to add your comments here. Update: A writeup of the FEMA portion of the meeting is in the comments from Adam Ganz. Thanks Adam!